Free miniature and dollhouse projects and tutorials for coffee, tea, and pastry shop scenes and settings in several scales. Included in this list are wallpapers, polymer clay food, plates, teapots and cups, printable tea, coffee and dessert sets, and fixtures and furniture for shop scenes. 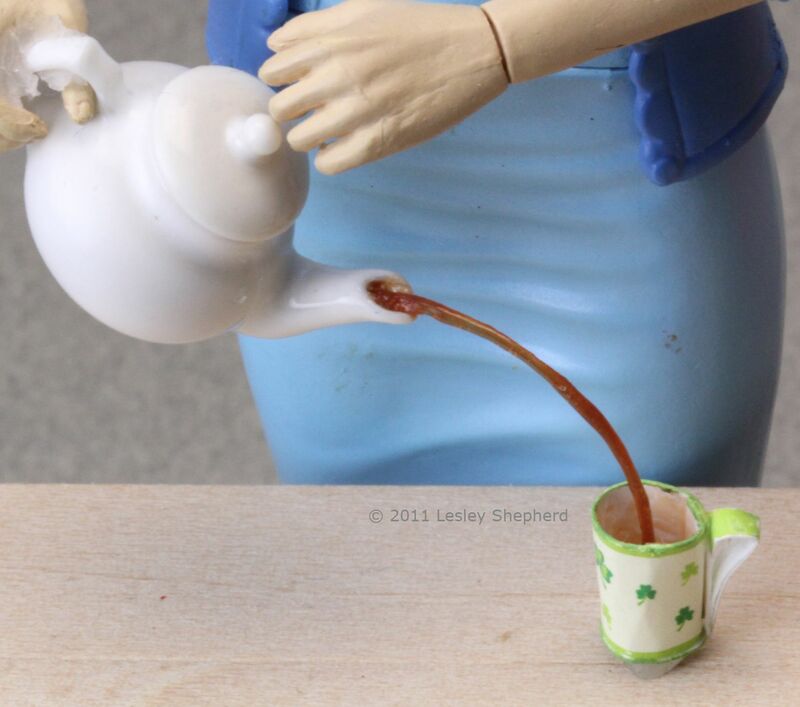 If you want to add a sense of movement to your scenes with tea or coffee miniatures, set up a pour of 'liquid' from a tea or coffee pot into a cup. This technique doesn't take exotic materials, and you can set it up with any color of 'liquid'. You can set these tiny teabags into a cup or teapot, or lay them on a saucer, as well as fit them into boxes for countertop displays. These are easy to make from sewing supplies. Need printable wallpaper for a tea or coffee shop? These designs feature teapots, or coffee pots and cups and come in a range of colors, sizes and scales. Printable dolls house scale coffee pot, coffee cups, tea cups, saucers, cream and sugar, teapot, cake stand and dessert plates with a shamrock design. Photo copyright 2010 Lesley Shepherd, Licensed to About.com Inc.
Print and assemble tea or coffee sets and dessert plates for a range of settings. The printable kitchen miniatures list linked above shows all the designs, or you can go directly to your favorite design with the link below. Miniature Teddy Bears Picnic with a Dolls House Picnic Basket. Photo ©2008 Lesley Shepherd, Licensed to About.com Inc. This miniature fitted picnic basket is made from a faux weaving technique that uses needlework canvas as the base. You can fill it with one of the printable tea sets linked above, or fill it with any food you'd like to take on your miniature picnic. realistic miniature peaches - complete with fuzz! To show off your collection of miniature pastries, make this 'glass topped' display case. The shop counter can be fitted with miniature woven pastry baskets or woven drawers, and if you want to display your cupcakes or muffins on the counter, there is a wire cupcake holder. These simple pastry or cake stands can be made from punched paper and beads, or from polymer clay. Make them in a range of heights to show off your favorite pastries in a display case or on a counter. In addition to the teapots / coffee pots linked above, which can be made to pour, you can make dessert plates from polymer clay as well as tea cups and saucers, and decorated mug sets. If your tea is served to fairies or woodland creatures, this miniature tea set made from acorns might be your choice. If you don't have access to acorns, try hazelnuts (filberts) instead. Printable French bakery boxes to hold your dolls house cakes and pastries. Photo copyright 2009 Lesley Shepherd, Licensed to About.com Inc. These solid or open bakery boxes can be used to hold whatever you cook up for your tea, coffee or pastry shop. The bakery boxes match the printable French wallpaper and fabric designs so you can add chairs, cushions or wallpaper and shelving liners in a related pattern.